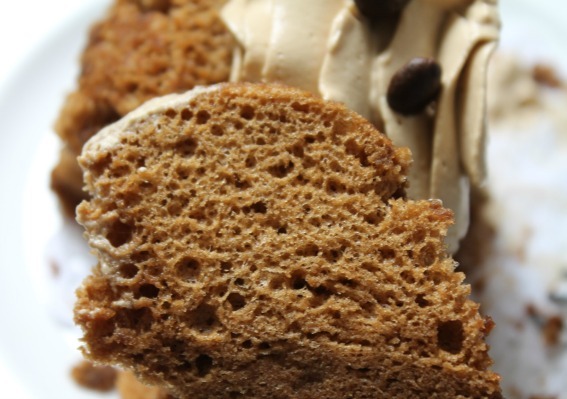 my bare cupboard: Coffee chiffonlets with coffee crème chantilly "
Go on , check wiki or just Google it ! I've used a donut tin in baking this . You can never go wrong with Rose Levy Beranbaum's recipe , just don't mind the long winded instructions on most of her recipes heh ! You need four 4 1/2 by almost 2-inch nonstick mini angel food cake pan ( 1 3/4 cups capacity ) or six 4 by 1 3/4-inch ( 1 1/4 cups capacity ) , ungreased . * Twenty minutes or more before the baking time , set oven rack to the lower third and preheat oven at 325°F/160°C . * In a bowl of a stand mixer , mix flour , all but 2 teaspoons of sugar , baking soda and salt , mix on low speed for 30 seconds . Make a well in the center of the mixture . * In a small bowl , stir together the coffee extract and 1 tbsp of the water ( or instant espresso and 2 tablespoons of the water until the coffee granules has dissolved . Pour mixture into the well of the dry ingredients , together with the yolks , oil and vanilla . Beat on medium speed for about 1 minute or until very smooth , scraping down sides of the bowl as necessary . If you don't have a second mixer bowl , scrape this mixture into a large bowl and thoroughly wash , rinse and dry the mixer bowl and whisk beater to remove any trace of oil . * In a clean mixer bowl , beat egg whites on medium speed until foamy . With the beater off , add the cream of tartar . Beat until soft peaks form when the beater is raised slowly . Raise speed to medium-high and beat in remaining sugar , beating until stiff peaks form when beater is raised slowly . * With a large whisk or slotted spoon or large silicon spatula , stir about 1/4 of the meringue into the batter . Gently fold the remaining meringue into batter until uniform in color . Pour batter evenly into the pan . * Bake for 20 to 25 minutes or until wire cake tester or skewer comes out clean and the cakes spring back when pressed lightly in the middle . Immediately invert the pans onto the wire rack to cool completely , 20 to 30 minutes before removing . * Chill ingredients and equipment beforehand . * Put cream into a chilled bowl and whisk steadily but not to fast for about 2 minutes or until cream starts to thicken . * Add icing sugar and vanilla . * Whisk faster until mixture is very fluffy and forms soft peaks . *** Dissolve 2 teaspoons instant coffee powder in 1 tbsp hot milk and allow to cool . Add the cooled coffee to the sweetened cream before beating . I don't know the difference between whipped cream and Chantilly ,what I know is that I love these coffee flavored chiffonlets. I am bringing my coffee to your house. Anne, your mini cakes are just gorgeous!!! And your coffee cream topping is exquisitely done...your rocked this one, my friend!!! Your chiffonlets look so nicely and neatly done. I will try this chiffonlets. The 56g yolks and 120g whites, are.they from the 3 egg seperated and 1 white? I have some awards for you, dear. Doreen , yup , that's right re eggs :D Thank you so much for that award ! Happy Easter Day to you. Look like i have to dig out Rose'book that i put aside for too long and never try any of her recipe in view of the long instruction, hehehe..I really love this series of photos, simply gorgeious, well done Anne! Anne! 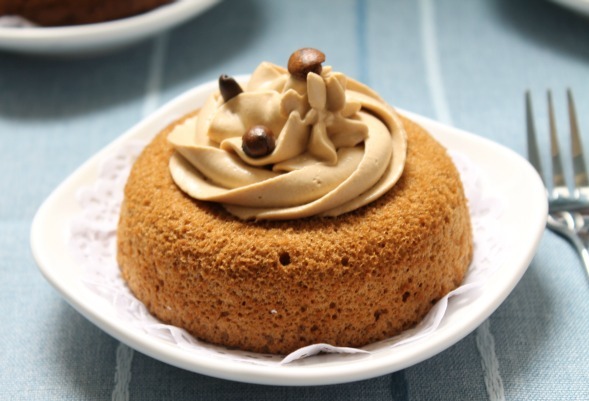 I love these mini chiffon cake look delicious!! Beautiful! The frosting makes the cake! 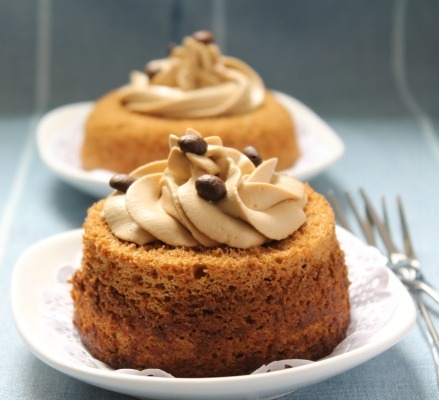 These coffee chiffon cakes look really delicious... So soft and fluffy. Perfect with that cream on top. 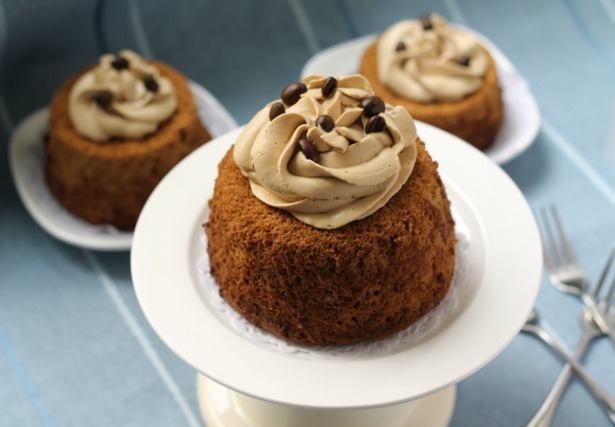 Hi Anne, these are such beauties (they look so airy) and the coffee cream I could eat all by itself! The name of these little delicious cuties, sounds so classy and elegant! And sure enough, your lovely chiffonlets do look classy and elegant! And so delicious! I think I could finish a few in one sitting! Coffee is my must-have in the mornings! Having it in cute little cakes is a delicious bonus! These are so gorgeous! Beautiful presentation and they look seriously yummy. They look so tempting, Anne! It's tea time for me and I would love one of those right now! chiffonlets! that is adorable! and mmm a light coffee flavor? sounds heavenly. 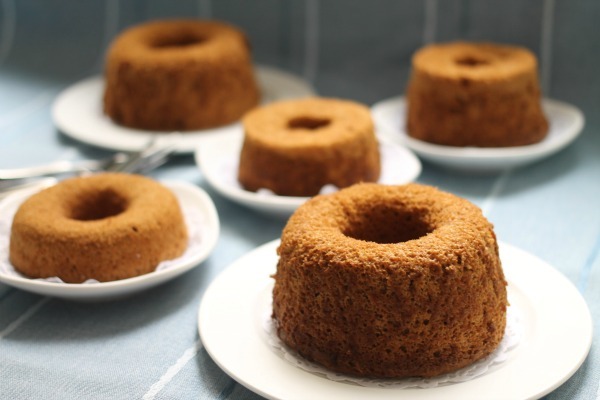 hi anne, what a good idea of using donut pans to bake these chiffonlets! I never thought of that, they turned out very pretty too with the piped chantilly cream! if you put this in front of me, sure i'm going to grab five! LOL! Totally agree is Rose Levy Beranbaum's recipe is super long winded but very reliable... Feel tried already just reading her recipes... LOL!